Assists in proper positioning of femurs and pelvis. Three zones of a proprietary gel-like polymer provide added pressure dispersion under the thighs, greater trochanters, and ischial/coccyx region. Extra softness under the most vulnerable bony prominences in sitting. 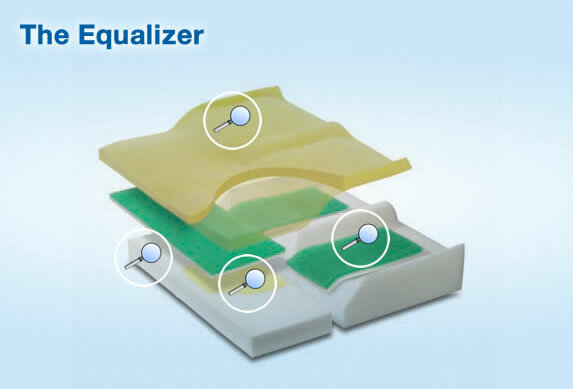 The Equalizer’s multi-component construction features an ultra-comfortable viscoelastic “memory foam” top, a contoured foundation layer for proper positioning of the legs, and an extra soft relief zone for high-risk bony prominences. Three zones of a proprietary, gel-like soft polymer provide added pressure dispersion under the thighs, greater trochanters, and ischial/tailbone region. The cushion’s moisture-resistant cover has a rugged nylon bottom with a 2-way stretch fabric top and convenient front carry handle. Cover accommodates optional Sling-Fill Base. The Equalizer is available in four standard sizes with an average weight of just 4 pounds. Also available in bariatric sizes. 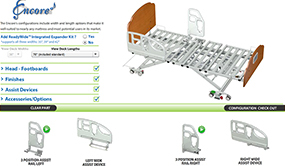 The Equalizer is recognized for reimbursement under Medicare codes E2607 (< 22” wide) or E2608 (>22” wide).